Sterile conk trunk rot fungus (Inonotus obliquus), also known as shelf fungi or bracket fungi, occurs predominately on birch trees but can all affect other tree species--alder, beech and hickory. The fungus produces large, black growths on the trunk of the tree that measure up to 12 inches in diameter and grow up to 60 inches in length. The conks produce no actual reproductive spores, unlike other fungal conks. The fungi does considerable damage to the tree and will eventually kill it. Native indigenous tribes once used the conks on birch trees, known as chaga, to make medicinal powders and teas, which were considered curative. Today, the conks are widely harvested in Siberia because Russia and Japan both use the fungus in the manufacture of anti-cancer drugs that are widely marketed, according to the Alaska Department of Natural Resources. The conks, already relatively rare, may become even rarer as collectors over-harvest, cutting the conks from tree using chainsaws to expedite the harvest. The external area of the conk appears black. Cut open the conk has a spongy, orange-yellow appearance with areas of white coloration. The area of the tree trunk that suffers from the fungus often becomes swollen beneath the conk and protrudes outward. The area around the conk begins to crack and pull away from the tree. The fungus invades the tree through wounds, broken branch areas on the trunk or old cankers. Once inside the tree damage becomes extensive. By the time a conk develops on the side of the tree at least 50 to 100 percent of the tree's heartwood has already become infected with the fungus, according to the Natural Resources Canada. As the wood of the tree becomes weakened the tree poses a considerable danger because it may fall at any time. Once the tree falls and dies the fungi continues to thrive. It quickly invades the decaying wood. The bark of the tree begins to break away and decompose, which reveals the spore-producing area of the fungus. The actual fruiting body of the fungi is revealed under the bark. It appears as grayish, heavy pored growth that measures approximately 3 millimeters in thickness. Once the fruiting body is revealed the fungi begins to produce reproductive spores, which are carried by the wind, rain and wildlife to other birch trees in the area. 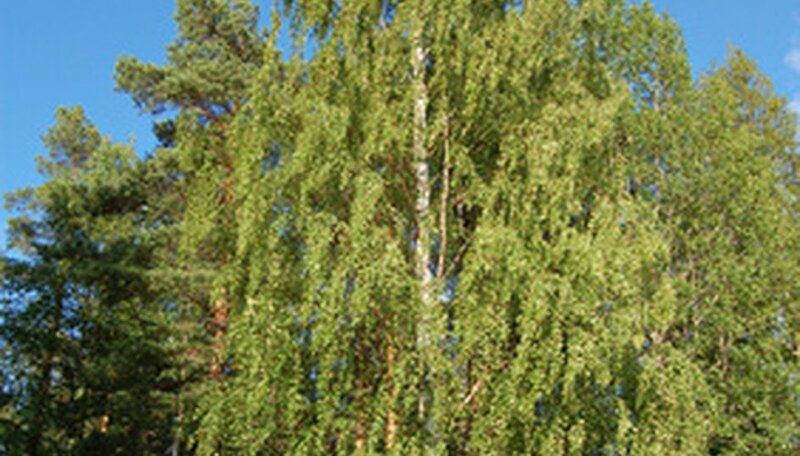 Landscape birch trees need to be regularly maintained through proper watering and fertilizing. Avoid damaging the tree through cultivation or over-pruning. Once a birch tree becomes infected with sterile conk trunk rot fungus there is no cure. The tree will need to be removed, the wood sawed up and destroyed. The conk can be harvested for sale or donated to medical science.